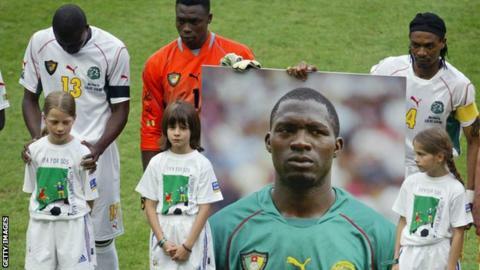 It was the brutal abruptness of Marc-Vivien Foe's fatal collapse that made it so shocking. In the 73rd minute of the Confederations Cup semi-final between Cameroon and Colombia at Lyon's Stade de Gerland, the powerful midfielder was jogging along innocuously. No-one was close to him and nothing seemed wrong, yet suddenly he collapsed to the ground in the centre circle. Medical and support staff attempted to resuscitate the player on the pitch, before carrying him on a stretcher to the bowels of the stadium, where attempts to restart his heart failed and the man known affectionately by his team-mates as 'Marco' was pronounced dead. That was 10 years ago, on 26 June 2003, but the memories are still painfully fresh for Cameroon's then manager, Winfried Schafer. The German says neither he nor his players had realised the seriousness of the situation at first. "We won the match 1-0 and the players were dancing in the changing rooms afterwards," he told BBC World Service's Sportsworld programme. "Then [captain] Rigobert Song came in and cried and said "Marco, Marco" and told us he was dead. "Everyone was shocked and was asking why. All the players were crying. I went out of the dressing room and heard two ladies crying very, very loudly. Then I saw Marco lying there, on a table, with his mother and wife by his side. I touched his leg and I went outside and cried too." Pat Nevin, then chairman of the Professional Footballers' Association, was broadcasting at the tournament and attended a special Cameroon news conference the following day. "It was devastating for everyone involved, but there were some lifting moments," he remembers. "Seven Cameroon players came out and they all spoke beautifully about their friend and team-mate and their desire to carry on in the tournament. "It was a beautiful moment after a tragedy and I've been a Cameroon supporter ever since." A first autopsy failed to establish the cause of the 28-year-old's death, but a second found he been suffering from a condition called hypertrophic cardiomyopathy. The big question everyone asked was how could a fit, athletic footballer with no known history of heart problems have died in such a way? "When you looked at that Cameroon team, they were big, strong and tall, and Marc-Vivien epitomised that," Nevin says. "He was a box-to-box player and his fitness was extraordinary." Sanjay Sharma, Professor of Cardiology at St George's, University of London, who has worked with both Manchester City and Team GB at the 2012 Olympics, explains that the first sign of the condition is often death. "People with the condition, which is characterised by abnormal thickening of the heart muscle, are about three to five times more likely to suffer a cardiac arrest if exercising vigorously than leading a sedentary lifestyle," he says. "Sadly, 80% of sportsmen who die from this condition have no prior warning signals and sudden death is the first presentation." After consultation with Foe's widow, Marie-Louise, as well as his parents, Fifa decided that the Confederations Cup final between France and Cameroon should go ahead as planned. Many of France's players, including striker Thierry Henry, were in tears as they lined up before the game. A picture of Foe was shown on the big screen ahead of the game and Cameroon's players held a huge photo of him during the trophy presentation to eventual winners France. The midfielder was given a state funeral in Cameroon in July 2003. Journalist Francis N-gwa Niba, who was there, remembers: "The funeral was huge. The president was there, [Fifa president] Sepp Blatter, everyone who was anyone in African football. "Thousands stood by the side of the road outside the cathedral and I remember one banner in particular, which read 'a lion never dies, he just sleeps'." Foe left behind a wife and sons aged six and three, as well as a daughter of only two months old. The player's generosity had been legendary, and there were reports that he hadn't much money left behind. Foe was buried on the site of the football academy he had been having built in his hometown of Yaounde. He used to send a proportion of his wages home to his father Martin each month to fund the construction of the complex, but N-gwa Niba says it now "sadly has practically been abandoned now because of lack of funding". Cameroon's Indomitable Lions have also been in decline following the death of their star midfielder. Going into the 2003 Confederations Cup they were the undoubted kings of their continent, having won the previous two African Cup of Nations tournaments, in 2000 and 2002. Since then, N-gwa Niba says "Cameroon football has been going down the drain" and they haven't won another Cup of Nations. Foe had been on loan at Manchester City from Lyon in the 2002-03 season, making 35 appearances and scoring nine goals. City retired his number 23 shirt after his death, while a street was named after him in Lyon. A positive result of Foe's death has been huge improvements in both the testing of footballers for heart problems and the treatment they receive during matches. Professor Sharma admits he was shocked when he watched footage of the on-field treatment that Foe received. "A player went down without any contact, his eyes rolled back, he had no tone in his body, so it was clear something terrible had gone wrong," he says. "It took quite a while for the penny to drop that this was not going to get better with the magic sponge or fluid being poured on his head though. As cardiologists, we like resuscitation to start within a minute and a half of someone going down, and for the defibrilator to be used within three minutes. "That gives us an outcome of about 70% living. Yet a good five, six minutes went by before I could see any positive action with Marc-Vivien Foe. That was perhaps because this was the first time something like this had happened in football. After all, you don't expect a champion footballer like this to go down and die." Fifa's chief medical officer, Jiri Dvorak, admits big improvements had to be made following Foe's death. "We have done a lot of work to reduce the risk of sudden cardiac arrest since then," he told BBC Sport. "At all levels, we have examination of players before arrival at a competition. "We have also trained the sideline medical teams in CPR and using defibrilators. We have a plan if something happens and the equipment - including for the team physicians of all teams. The medical personnel are adequately educated." Professor Sharma says such improvements were in evidence when Bolton midfielder Fabrice Muamba suffered a cardiac arrest during an FA Cup match against Tottenham last March. "If you look at the first minutes of him going down, it was clear the medical staff quickly realised the severity of the situation," he said. "The first thing I noticed in the Bolton doctor's hand was a defibrilator. They started resuscitation on the pitch and delivered two shocks before they moved him." There will be a tribute to Foe before Wednesday's Confederations Cup semi-final between Brazil and Uruguay. A decade on, football will remember a fine player who grew up in poverty in Africa and went on to play in some of the biggest leagues in Europe. Foe's former team-mate, Shaka Hislop, says he will mainly remember a friendly, happy and down-to-earth man though. Foe arrived at West Ham in 2000 as their club record £4m signing, yet could not have been more unassuming. "He was much-heralded and seemingly had the world at his feet," says Hislop, "but he was as genuine and likeable as they come. Regardless of what was asked of him, he did it with a smile and I thought he represented the best of football and footballers."